The basis of HOLA automotive parts production consists of more than 15 factories situated on all continents around the world and certified in ISO/TS16949 system. Strict control of used raw materials at all stages of production processes together with exclusive system of finished products quality control allowed HOLA spare parts to gain the trust of customers around the world due to reliability, safety and high quality. Attention to details, constantly improved technology and safety is a criterion of successful brand development for employees. Foundation of engineering company - H&H Groep. Headquarter and innovative development center is situated in Maastricht, the Netherlands. Company business profile – development and introduction of high quality manufacturing standards for auto spare parts and adaptation of products in compliance of state standards around the world. Attention to details, permanent improvement of technology and security are the criterion for successful development of a common cause. Relying upon its own development and cooperation experience with international corporations specialized in manufacturing of automotive components, company introduces its own brand HOLA on the market. Focusing on quality allowed engineers of H&H Groep to establish efficient relations between production process and own innovation center, forming this important key characteristic on the early stages of HOLA brand development! To improve production quality of HOLA automotive components H&H Groep employees carefully control raw material suppliers who have certificates of quality management system in accordance with ISO 9001, which guarantees the reliability of the supplied accessories. Standards developed by H&H Groep specialists are recommended to each manufacturer in order to maintain control of the manufacturing processes throughout the production chain. Two-stage control system performs automatic checking for the analysis of the basic production characteristics and close examination of auto parts technical specifications by leading company’s engineers personally. In this case specialists achieved the equally high quality production of all HOLA parts independently of country of origin. 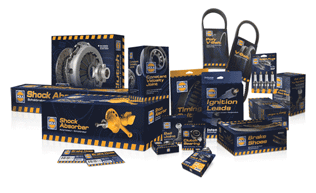 Long-term cooperation with leading car manufacturers allows H&H Groep to provide customers with reliable and high quality steering parts TM HOLA. H&H Groep specialists reached agreement on cooperation with the world leader in production of autoparts. Experience on automotive parts market and centers of innovation developments have formed the basis for mutually beneficial alliance and implementation of the best ideas. The range of HOLA brand was complemented with new product group - shock absorbers, strut mounts. New production stages for suspension elements and steering parts were developed and implemented by means of starting of additional auto parts manufacturing stages. It allowed to take the operating characteristics to a new higher level. The range updated with new product groups – Constant Velocity joints and clutch elements. 5th anniversary of TM HOLA foundation. Successful production and economic activities have brought its results, reliability of HOLA automotive components won the trust of customers around the world. Universal joints and strut mounts are implemented in production line. These products became popular among customers and were highly appreciated by professionals. The company engineers provide manufacturers with special instruction according to which control over the raw materials in use is increasing. All incoming materials pass multi-stage testing. Moreover, manufactured production is subjected to additional processing steps. Introducing technologies have greatly reduced production costs, which favorably affected the final cost of auto components. This measure helped to further strengthen of position in the world market! Brake hoses, bearings HOLA are available for sale. All products are certified in accordance with quality standard ISO/TS16949. Reliability, safety and high quality of HOLA automotive components are proved once again. Well-proven product line of HOLA brand was supplemented by five product groups: wiper blades, brake pads, air, oil and fuel filters, ignition leads and spark plugs. By the end of 2010 under the HOLA brand name are produced more than 1000 kinds of spare parts. Towards professionals and car owners could navigate in variety of products, was created electronic catalogue with possibility of spare parts selection on the basis of car models. With the expansion of HOLA brand product range significantly increases the number of vehicle makes and models for which HOLA auto parts are applicable. At the beginning of 2011 HOLA parts could be chosen to more than 2700 makes, models and modifications of vehicles. In May 2011 a search service by original numbers and the numbers of analog components manufacturers (search by crosses) was launched in catalogue of HOLA spare parts. This service greatly simplifies the work with HOLA range for trade organizations, employees of service stations and car owners. In order to expand the business, financial capacity and strengthening of distribution channels, company H&H Groep and WEEN B.V. combined their capabilities. New company was called WEEN H&H B.V. and is the owner of the trademark HOLA. Due to combined management and technical infrastructure products manufactured under HOLA trademark have improved consumer properties that is confirmed by increased factory warranty. Since 2012 HOLA products have become available in new packaging that reflects a new level of product quality and better protected from the possibility of fake. Range of trade mark is complemented by new product groups: radiators, water pumps, brake discs, belts. Company launched a Long Life Warranty program designed to improve the quality management system through improved manufacturing management policy. HOLA products quality was controlled by inspectors of DEKRA* expert company. As result technical specifications and stages of manufacturing system upgrade have been defined. *DEKRA is an international leader in inspection and safety, and acts as a key expert in the automotive industry.